Antrim beat Westmeath by six points in their opening Leinster SHC qualifying group match at Ballycastle. Westmeath led by four points after five minutes but a succession of points from the prolific Paul Shiels, mostly frees, brought Antrim back into the game. The Saffrons led 0-12 to 1-8 at half-time, before the visitors were reduced to 14 men after having a man sent-off. Another Westmeath goal helped them move to within three points but Shiels kept the Antrim scoreboard ticking over. Kevin Ryan's side face Carlow in their next fixture on Sunday 4 May. 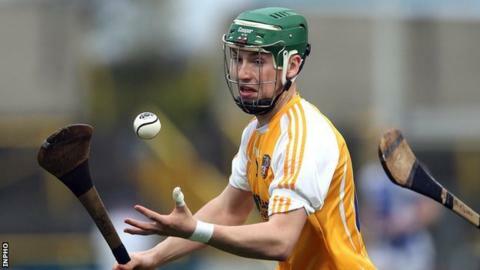 Antrim: C O'Connell; O McFadden, C McKinley, C Johnston; E Campbell, N McAuley, N McManus; D Hamill, B McFall; C Carson, P Shiels, S Beattie; C Clarke, M Donnelly, PJ O'Connell.